The unique two hectare dome (the World’s largest) spans over a gorge of indigenous forest. The sanctuary has its own mysterious ruin, which incorporates a walk-behind waterfall. Another feature is its amphitheatre, which has the ability to seat over 200 visitors. 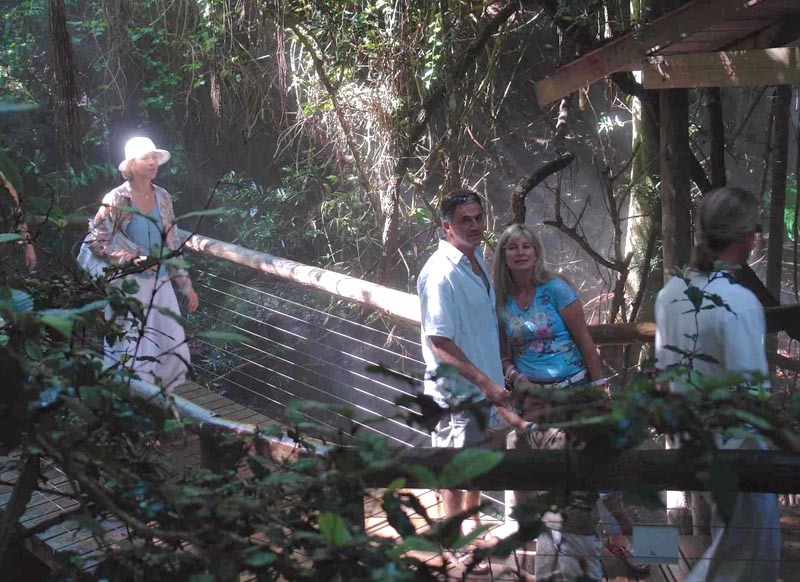 Like Monkeyland, the popular primate sanctuary next-door, Birds of Eden boasts its own canopy walk, while shorter than the 128m bridge at Monkeyland, it hangs above the clouds. The decision to develop Birds of Eden stems from the need to create a safe environment in which to release a large collection of free-flight African birds, miniature monkeys and the sanctuary also enables bird owners to apply to release their pet birds into the sanctuary, after undergoing rehabilitation. Birds of Eden opened it's doors to the public December 2005. Currently over 3500 birds live at the sanctuary. 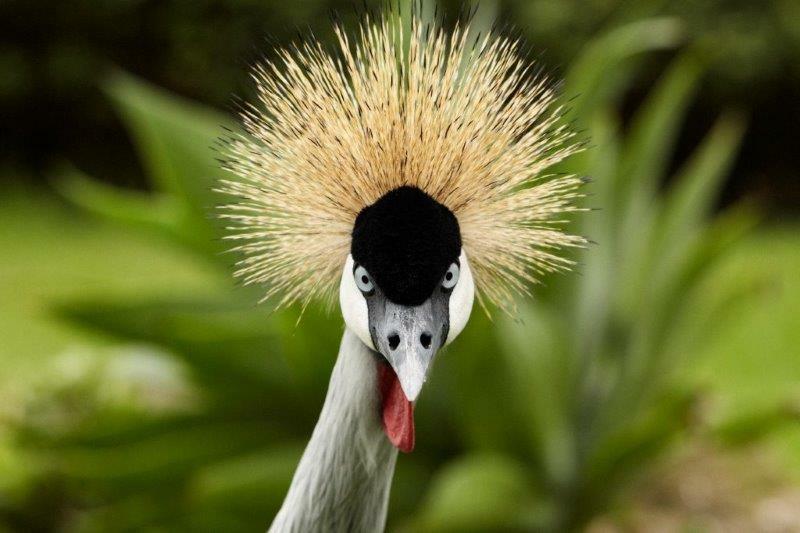 In 2010 the species count at Birds of Eden is just touching 200. 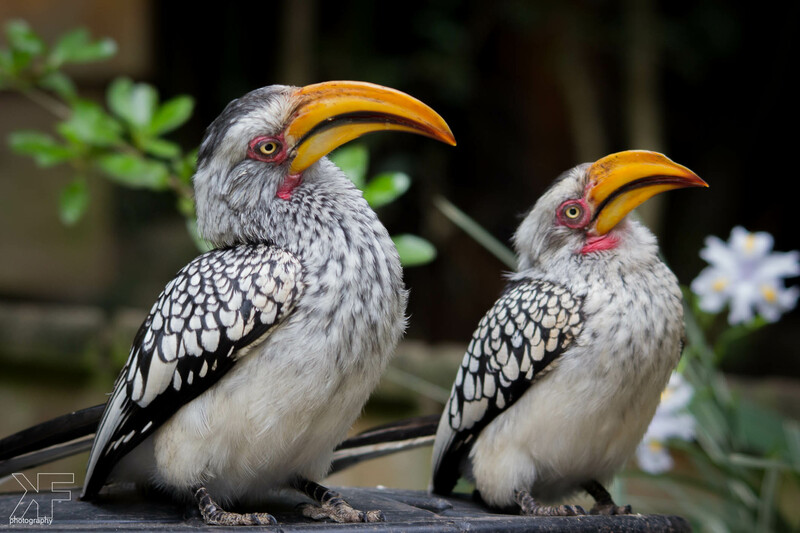 The bird inhabitants of the aviary comprise a mixture of exotic as well African birds (50/50). They also include previously caged pets and hand reared and imprinted individuals, this explains why some of our inhabitants (especially the parrots of which we have 60 different species) are unafraid of human beings and seemingly tame. All new arrivals at Birds of Eden go through a process of rehabilitation before they enter the actual sanctuary of the main aviary. Be they ex-pets, or birds confiscated from zoos or irreputable breeders, most of the birds that arrive at Birds of Eden have a history of being caged in small environments. The main rehabilitation process involves socialization with other birds in large outdoor pre-release aviaries as well as the building up of flight muscles, and learning flight control, i.e. practicing landings, change of direction etc. Make no mistake! All birds can fly, no matter how badly their wings are clipped; the question is just how high and how far. Releasing them into the main aviary immediately, would be tantamount to running a marathon without any training! 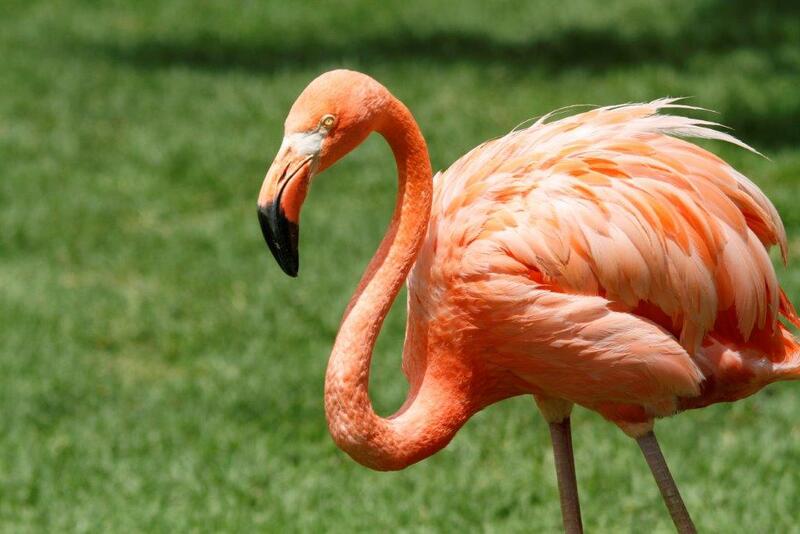 Birds such as the cranes, flamingoes and some of the ducks have been subjected to the cruel practice of pinioning, where a section of the wing is actually removed to prevent them from ever flying again. 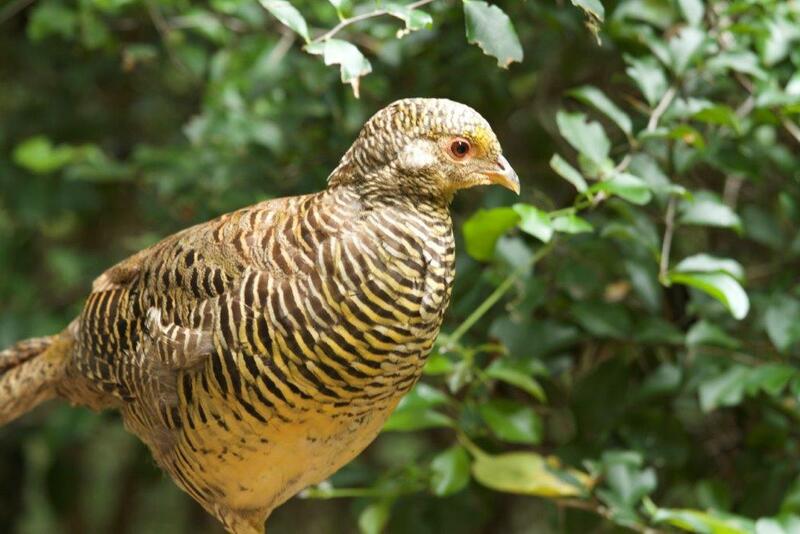 These birds find sanctuary in our aviary in as natural a habitat as is possible given their history. The rest of the release process is instinctive and absolutely remarkable; all the birds instinctively know which area of the aviary suits their needs, how and where to look for and find food and water and shelter from weather conditions. Species recognition is immediate, for e.g. when a new Ringneck is released into the aviary, all the other Ringnecks gather to have a look at the newcomer! The winning factor of the aviary has to be its size. The volume particularly, allows the creation of habitat niches for the large variety of species that find sanctuary here. On entering the aviary, one walks into an indigenous forest which comprises 70% of the aviary. Birds found in this habitat are either ground living (terrestrial) or arboreal and very shy. Examples are the Golden pheasants, the males noticeably resplendent in their breeding colours, the shy minuscule white starred robin, terrestrial Bulbuls, olive thrush, and bearded barbets and naturally in the canopy, the shy but colorful Tauraco species - Fleetingly visible when looking up into the canopy, recognizable by their incandescent red flight feathers. 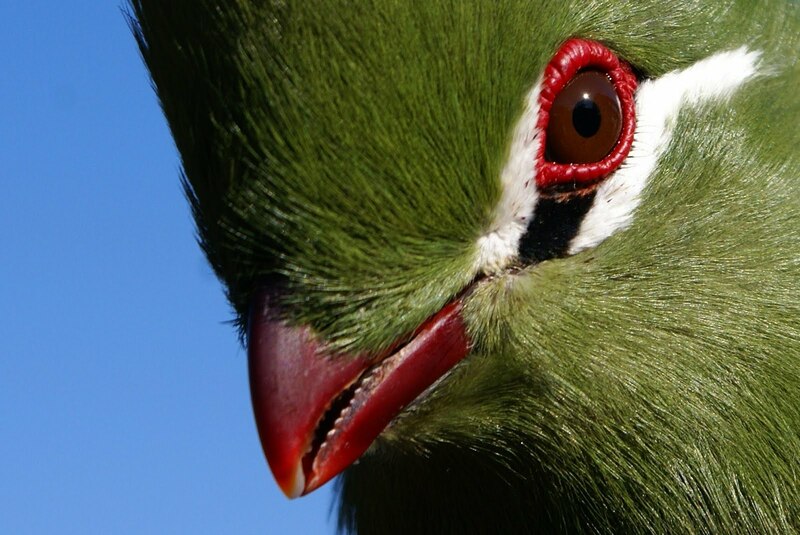 At present there are 8 species of Tauraco in the aviary, including the infamous Knysna loerie. Like plants, humans and all other living things, birds love the sun. This becomes apparent as one moves away from the forest floor and closer towards the canopy, the cacophony of sounds tells of abundant birdlife out of sight, but up there somewhere. In this part of the forest the Channel Billed toucan, and their miniature counterparts, the Black necked and Green Aracaris (toucanettes), as well as the White Tailed and Inca Jays, are memorable when spotted. One exits the forest on to the forest deck area, and here the splendor of all the parrot species really hits you. 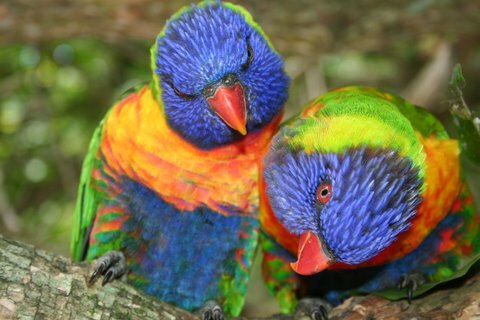 It is here that the Blue and Gold Macaws as well as the Green Wing Macaw hang out as well as the very vocal Conures (12 species); Ringnecks and other parakeets and lorikeets. The exit from the forest marks the beginning of a completely new habitat, namely that of the grasslands, marsh and woodlands, and of course the multiple waterways that traverse the duck ponds. Species to be sighted here are the Scarlet ibis, flamingoes (Greater and Caribbean), spoonbills, cranes (Blue cranes and Crowned cranes), egrets, moorhens etc. The smaller parrot species that prefer more open vegetation are also spotted here, (budgies, lovebirds and cockatiels). The lawn area provides resting and feeding space for most of our many waterfowl, (we currently have 29 different duck species), whilst the sparser trees are home to the hornbill (4 different species), and various weaver species, who utilize this area to build their nests over the waterways. 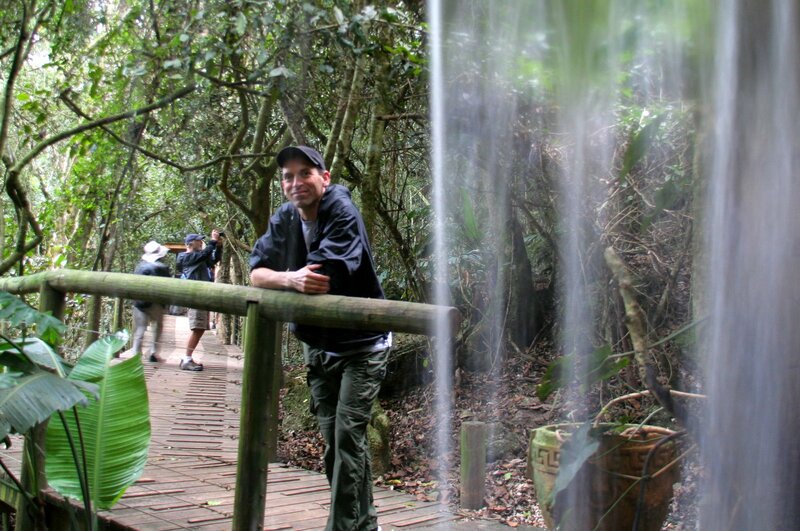 Birds of Eden is situated about 150km from Mossel Bay, about 50km from Knysna and about 240km from Port Elizabeth. Our exact location is The Crags, which is 16km east from Plettenberg Bay.